Have you ever seen a Cockroach launch a Bird? UC Berkeley’s Biomimetic Millisystems Lab is up to something interesting! VelociRoach and H2Bird are a robot team that works together to take flight! 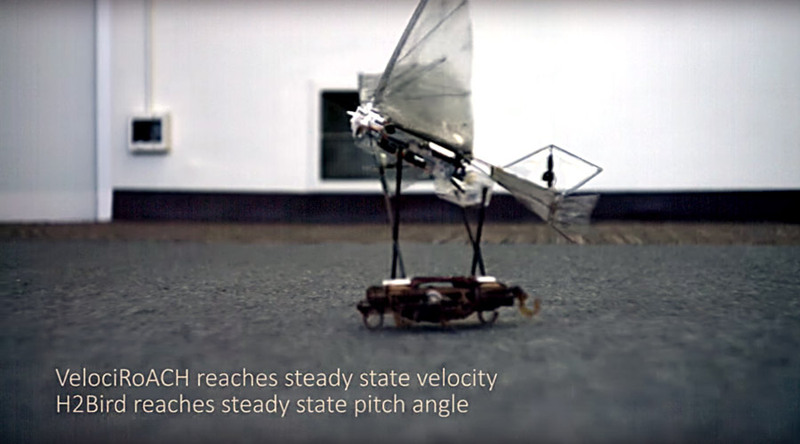 There are so many angles to look at this work from, whether it be the fact that they are mimicking the biology of cockroaches and birds, using sensors to determine the proper velocity and angle at which to launch the robot bird, or the fact that these robots are working as a team to accomplish the task of flight. There is a distinct advantage to using two separate robots to handle the task of liftoff, being that the cockroach handles all the necessary movement to lift off, and the robotic bird doesn’t carry the extra weight that would be necessary if locomotion was integrated into its design. Specialization of these tasks allows greater capability for the robotic team, which is pretty amazing. This entry was posted on Tuesday, June 2nd, 2015 at 10:15 am	and is filed under Fun Stuff. You can follow any responses to this entry through the RSS 2.0 feed. You can leave a response, or trackback from your own site.